Royal Caribbean International officially took ownership of what is the largest cruise ship sailing anywhere in the world, the Symphony of the Seas. 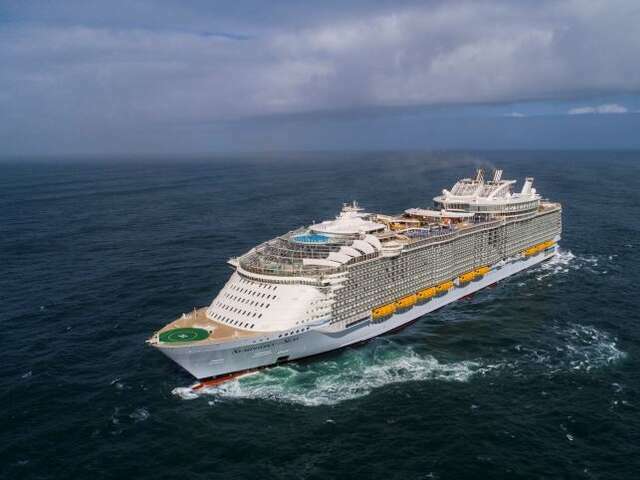 Royal Caribbean International officially took ownership of what is soon to be the largest cruise ship sailing anywhere in the world, when Symphony of the Seas was delivered to the line during a flag-changing ceremony at the STX France shipyard in Saint-Nazaire in March. “Symphony will take family vacationing to an all new level with energy and options never before found in one place,” President and CEO Michael Bayley said during the ceremony. The ceremony marked another milestone toward Symphony’s official debut, which took place when the ship sailed a five-night itinerary out of Barcelona on Mar. 31, 2018, followed by two seven-night itineraries out of Barcelona on Apr. 7 and 14. The 230,000-gross-ton ship will be able to accommodate 5,518 guests in 2,759 staterooms. It measures 238 feet tall and 1,188 feet long. Features include a 10-story waterslide, the tallest on any cruise ship, called the Ultimate Abyss; a revamped boardwalk area with a new bar and candy and ice-cream shop; Royal’s first New England-style seafood restaurant, with Hooked Seafood located in the ship’s Solarium; and a brand new original show, “Flight,” a satire of the history of the air travel industry. It will also feature “the world’s most adventurous and interactive family suite,” according to the line, which will include a kid’s-only bedroom on the second floor with a slide to the living room down below. The suite will also include a floor-to-ceiling LEGO wall, an air-hockey table, and a separate 3D-theater-style movie room with a popcorn maker. There are also twenty-eight additional balcony rooms overlooking the Boardwalk area, a feature that separates Symphony from the other ships in Royal’s Oasis class — Oasis of the Seas, Allure of the Seas, and Harmony of the Seas.